I stand to be corrected, but I believe this is the first book written by Giovanni Bonello on a legal matter. He has written several enlightening articles on law. His contributions in The Sunday Times of Malta have become a legend in themselves. He has written extensively about Malta’s culture and history, rendering them accessible to the layman. Books have been written by others on his concurring and dissenting judgments at the European Court of Human Rights (When Judges Dissent and A Free Trade of Ideas). This is, however, his first legal work. And what a work it is! This collection of articles by the author, which appeared in The Sunday Times of Malta, is basically a bill of indictment against the judiciary for not protecting the Constitution and human rights throughout the years. 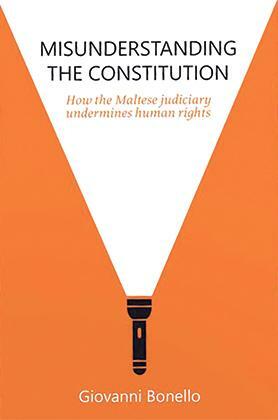 The title is indicative of the contents and style of the book: Misunderstanding the Constitution: How the Maltese Judiciary Undermines Human Rights. For the prudent, this might sound irreverent. For the pusillanimous, shocking. However, when one browses through the book and encounters the long list of failures and shortcomings of our apex court in the human rights field, both style and content appear more than justified. Throughout the years, stratagems and byzantine thinking deprived the Maltese citizen of some of his most fundamental human rights. The right to one’s home was only proclaimed in 1988. Up to the late 1980s, no Act of the Parliament was ever declared to be null and void and constitutionally invalid. Requisition orders in the Ferro case were given an extensive imprimatur and blessing by the Constitutional Court which wantonly created a legal fiction that possession of a building imme­diately passed over to government once a requisition order was issued. Perhaps Bonello’ s fiercest criticism is directed against the general principles proclaimed by the Constitutional Court as regards the effects of judgments on the constitutional invalidity of laws. In its wisdom the highest court in Malta has proclaimed that the effects of judgments declaring a law to be invalid applies only to the parties to the suit and not erga omnes, against everyone. (Bugeja 2011). This judicial intervention runs counter to the clear and express words of Article 6 of the Constitution, which proclaims the supremacy of the Constitution and that any law to the extent of its inconsistency with the Constitution, is null and void. It does not state “only between the parties”. I have written on this subject elsewhere. In part, this defective theory is based on another erroneous in­ter­pretation: that of legal standing. Our courts in public law are blindly applying civil law notions, such as a strict interpretation of juridical interest or legal standing, with disastrous consequences. Since challenging an executive action or law on human rights grounds requires one to prove direct, immediate, juridical interest, the apex court in Malta has come out with the idea that a judgment declaring a law invalid can only apply to the parties who have such interest. Compare this situation with that prevailing in the UK. In the landmark Miller case, in 2017, where it was claimed that Article 50 of the European Treaties, starting the tortuous process towards withdrawal of the UK from the Union, could only be triggered off after approval by Parliament, one of the plaintiffs was a hairdresser. Had the case arisen in Malta, our courts would have re­ques­ted him to prove that withdrawal from the EU would result in a significant loss of customers at his hair salon! Another broadside launched by Bonello is directed at the important issue of remedies. Once plaintiff laboriously wins a case, the appropriate prize is not awarded. Laws have been declared to be in violation of the Convention by the European Court and yet our apex court has refused to apply correctly article 6 of the European Convention Act which allows it to enforce such judgments. A special chapter is dedicated to the Courts’ interpretation of public interest. For years, no court would ever dare to inquire into the reasonableness of an executive decision; even when as in the case of requisition orders, these by law had to be issued in the public interest. In one case (Galea 1980), the courts declared nonchalantly that the requisitioning of private pro­perty to be assigned as a club to the party in government was in the public interest; and in another more recent case (Vella 2012), the requisitioning of premises in Kirkop in 1956 to be used as a band club was deemed to be in line with the public interest requirement. What is even worse, as Bonello points out, is that in two cases of blatant abuse of executive power (Grech 2010, Vella 2012) in issuing requisition orders to serve private, political or parochial interests, the courts – rather than declaring the order invalid and ordering the release of the property to its rightful owners –merely compensated the owners from public funds. So the beneficiaries of the abusive act remained comfortably in possession of the premises; the taxpayer footed the bill for the Labour Party to hold on to its club in Santa Venera, and a band club in Kirkop kept its premises. Bonello was legal counsel in 170 human rights actions. It was his involvement in human rights which made this branch of law appear on the Maltese legal and judicial radar. He was a pioneer behind most of the changes provoked by actions, such as that anyone in Malta can only be judged in crimi­nal proceedings by a court of law and nothing else (Vella 1983), that holding a poster in one’s hand is a form of freedom of expression (Calleja 1976 ), or that expropriating the Catholic Church’s pro­perty, even if for the national interest (Mercieca 1984) necessitated the payment of adequate, not derisory, compensation. The first transgender case (Gilford, 2001) allowing a person to change his or her name bears his mark. He defended human rights wherever he saw a breach of these fundamental principles. Bonello’s mastery of the English language, its meta­phors and similes, is outstanding. I recall that, once, in my youn­ger days, as I clung to the hem of his toga as he hopped in court from one human rights case to another, he showed me one of his contributions to Page Thirteen, which he was about to publish. The book contains two interesting and erudite contributions as an introduction, one by the ser­ving Maltese judge on the European Court of Human Rights, Mr Justice Vincent Degaetano, and the other by Professor Kevin Aqulina, Dean of the Facul­ty of Laws. Judge Degaetano joins Bonello in criticising the local courts, namely “the inability of the courts to provide practical and effective relief, as required by the case law of the European Court of Human Rights”. In conclusion, this collection of a series of articles published in recent times in The Sunday Times of Malta is a must-read for anyone interested in public law, but also for any individual who harbours an interest in public affairs and the way the State should treat its own citizens. This book by Giovanni Bonello should serve as a springboard for mending flaws in the constitutional text where they exist, but above all, an opportunity for trends to change and for those who sit in judgment over government and citizens to uphold the Constitution by applying it in a meaningful and effective way.